Rosalind Wiseman, author of Queen Bees & Wannabes, is teaming up with Dove® deodorant to not only promote her new book, Boys, Girls, and Other Hazardous Materials, but to also help foster communication between moms and daughters. Starting this week, Wiseman will be hosting the Girl World Tour, a nationwide mother/daughter workshop, presented by Dove deodorant and the website DontFretTheSweat.com. The goal of this eighty-city tour is to bring mothers and daughters together to learn how to effectively communicate with each other during the critical tween years so that moms can continue to be a resource for advice and support. “It’s no secret that a child’s confidence often drops off as they enter their teen years; however, the good news is that parents can make a difference,” said Wiseman. “In fact, the Unilever Tween Confidence Index found that there is a measurable relationship between tween confidence and the value they place on talks with their parents. Which is why, I couldn’t be happier to be partnering with Dove deodorant to help parents and girls through this difficult stage of life.” Adds Heather Mitchell, Senior Manager, Marketing Communications, Unilever Personal Care, Hair & Deodorants, “We recognize that the transition from the tween to teen years can be difficult and stressful; that’s why Unilever feels strongly about supporting initiatives like the Girl World Tour to help kids and parents navigate this stage of life.” Past M2Moms® attendees will be familiar with Unilever’s success in connecting with moms. From Sarah Jensen’s presentation on Suave’s “Say Yes to Beautiful” campaign to Rob Master and Babs Rangaiah’s insight into Dove’s “Real Beauty” initiatives, Unilever executives have shared new promotions and strategies from the M2Moms® stage—keeping with the tradition of giving our audience members a sneak peek inside the latest brand strategies for reaching today’s moms. Who are you looking forward to hearing from this year—Kodak, Walmart, Universal Orlando Resort, Seventh Generation, Disney? 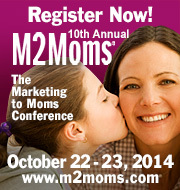 Don’t miss this year’s M2Moms®, October 27 & 28, 2010, at the Chicago Cultural Center. All content copyright 2008-2013 PME® Enterprises, LLC. PME®, PME EVENTS, and M2Moms® are trademarks and servicemarks of PME® Enterprises, LLC.